We've all heard about countless post office closures across the country... thanks to the fabulous PostMuse (and her excellent tweets) I've just discovered a way to help save one little post office from possible closure! It doesn't hurt that said post office, above, is quite tiny and adorable. 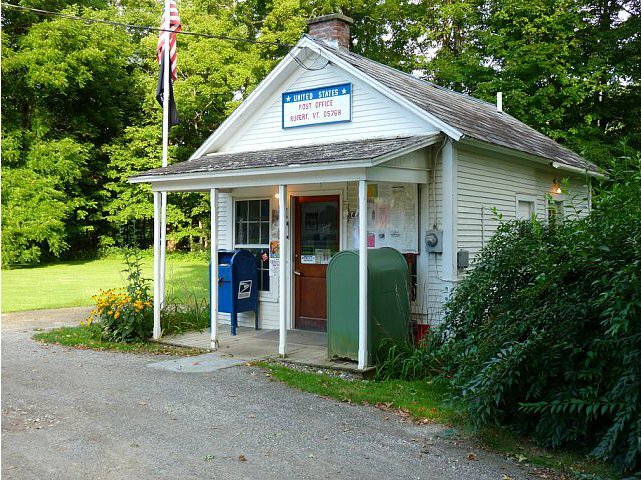 Do read the full saga of the post office in Rupert, VT. All the details are there. The skinny, though, is that this post office has had its hours cut and may face closure soon. There are two things that can help: revenue, which can only be generated on site at the post office, and VOLUME. So Jave Davies, the woman behind this postcard idea, decided that she'd increase the volume by sending out a plea for postcards to her P.O. box there -- AND she'l send 200 original art postcards in response to the first 200 postcards she receives. YOU send her an art postcard. It can be original handmade, or a photocopy of something you've made. Print your name and address clearly on the card. She will send YOU a postcard, handmade. "I don't promise it will be something you want to frame, but it will be original." She will send postcards to the first 200 respondents. She will post ALL the postcards she receives on her blog. On each card she will indicate the name of its creator and the place from whence it came. If the volume is overwhelming, she'll open a separate blog just for the cards. "If nobody sends me a card, I will be sad and our post mistress will be out of a good time, and eventually a job." Here's my little postcard offering, heading out in tomorrow's mail. I had fun edging it with gold washi tape. I don't post every mail art call that comes my way, but I think the idea of saving a post office through a flood of postcards is a pretty exciting one, and I hope that you'll consider sending one. Also, if you've ever wanted to see your postcard on a blog, she's promised to post them all, so that's pretty cool, too! And how cool is it to know that you're helping to save a post office, one postcard at a time? Well done you for supporting Jane. Mine will be on its way tomorrow. Let's hope she helps keep her post office open. Pretty cool. I'll do it, for sure! Whoa, Derrick - 14?!? That's awesome!! Thank you for posting this! I have seen lots of FB and retweets and mentions now and I hope this little post office will enjoy its mail deluge! I am not very artsy, so I may just send a letter. :) I am sure they won't mind! I'm very happy to hear about this plan to save the Rupert, VT P.O. I'm in! Sent mine out this afternoon and intend to send one every week this month. Then we will see where things are. I've sent several this week. I love my Post Office. I'd send you one, too, if you want and you get reach me at FPn to exchange address. And best wishes for 2013. Jane Davies is so getting my first ever attempt at mail art! I've had it ready for a couple of days but hadn't decided who to send it to. Now I've decided. :-) What a great project! I'm in! Go Jane!! Go Rupert,VT!! 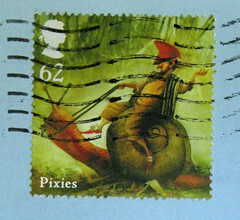 Just finished crafting a semi-arty postcard and will send it on its way in the morning with a new apple stamp. What a fabulous project! Wow, folks - the volume from commenters on this post alone will be fantastic! YAY! Thank you for posting this Missive Maven! 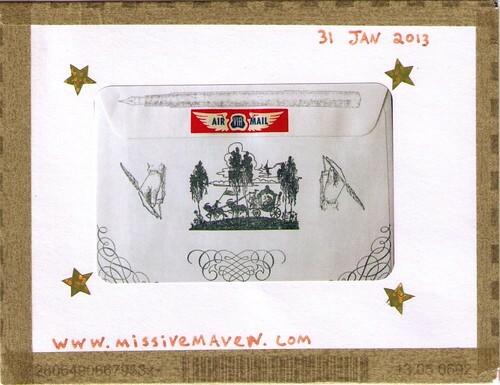 I am happy to send some mail art, especially if it means saving a post office and, more importantly, SAVING A JOB!! Sending one today. What an awesome project and a cool little post office! Current issue of Vermont Magazine did a piece on rural post offices. Here is the link to the PC I sent... I thought it was appropriate!